Since the very beginning, Beit Hallel Congregation encountered harsh opposition from the religious orthodox community, whom since 2011 would organize mass demonstrations, weekly gathering outside our building, systematically harass, bully, shame and threaten any of the 300 members who would weekly try to attend our Shabbat services. 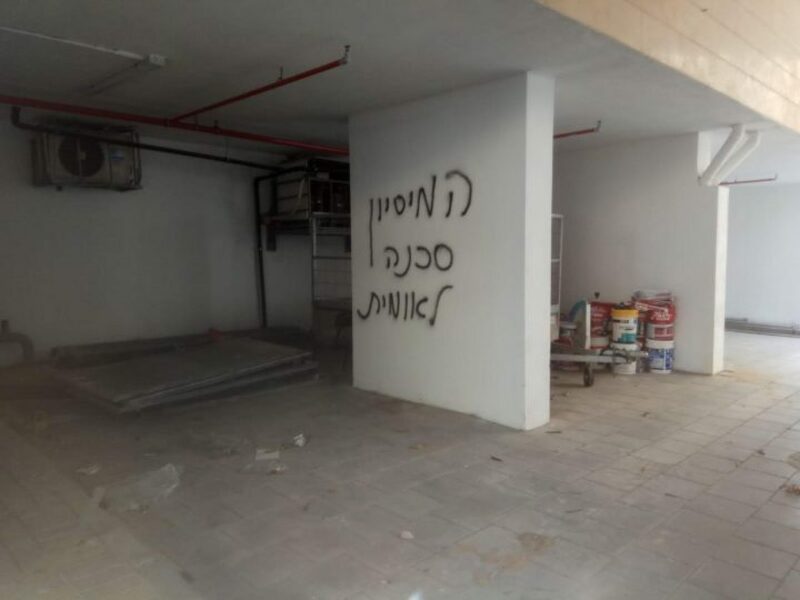 What began with these noisy and intimidating demonstrations soon morphed into a full-blown campaign to demonize Messianic Jews on a national scale, as well as spread the word throughout the Ashdod community that not only were we not welcome, but that we were harmful, dangerous and toxic to the Jewish nation. With that declaration, they became obsessed with ridding the city of our presence, using any means possible. It included following our leaders and congregants wherever we went, getting into our face, invading our space, filming us and being threatening in general. From there, leaflets were printed up with our faces on it and personal home address, distributed as “WANTED” posters and placed on car windshields, in personal mailboxes and plastered on poles and street corners. Newspaper articles and television appearances by members of the ultra-orthodox community began to surface as they did all they could to discredit and smear our names, when only “crime” was wanting to quietly attend our weekly worship services just as other Jews are permitted to do in the land of Israel. A few days ago, we faced acts of vandalism that were directed against us.Recently we had finished remodeling and renovating our new congregation building that we were finally able to purchase after many years, efforts and prayers. The building is private property, which is closed with a fence. 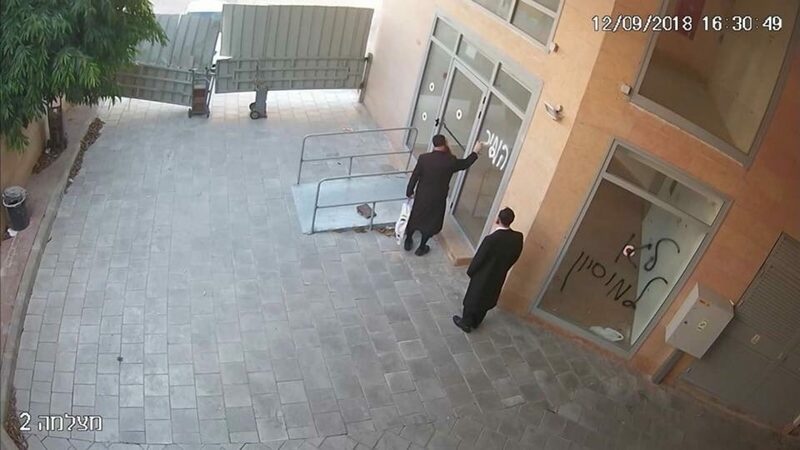 A few days ago, several orthodox entered illegally into our property and decided to vandalize private property in broad day light. 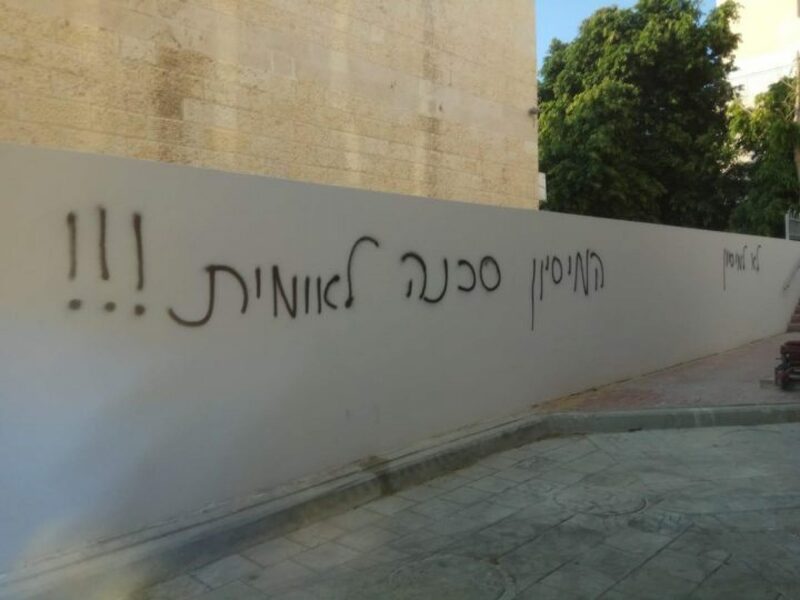 They sprayed all over the property graffiti making in clear it is an act of hatred and intimidation against Messianic Jews. Further more, they vandalized once and came back the next day to continue spraying more graffiti everywhere. They vandalized steel doors, walls, marble and windows, causing us financial damage. We immediately extracted footage from our surveillance cameras and went to press charges. 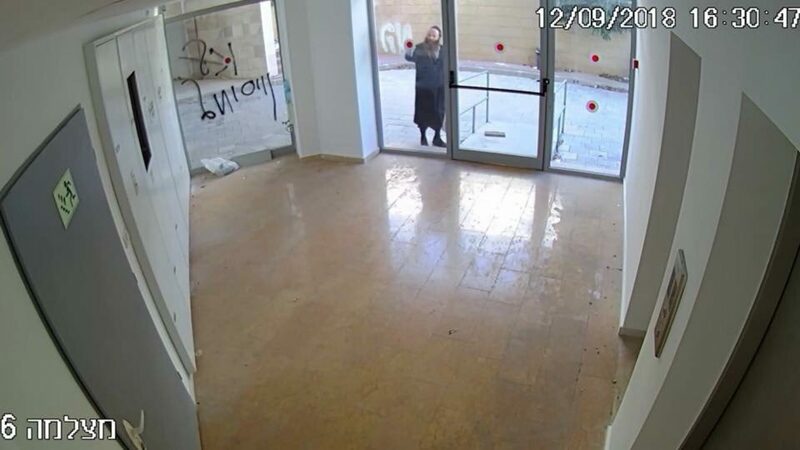 Incidentally, an IDF soldier, who happens to be one of the members of our congregation, saw two ultra- orthodox inside the congregational compound, wreaking destruction on our brand new building which had just been completed. The young soldier began to run after them and film them as proof of who the perpetrators were. 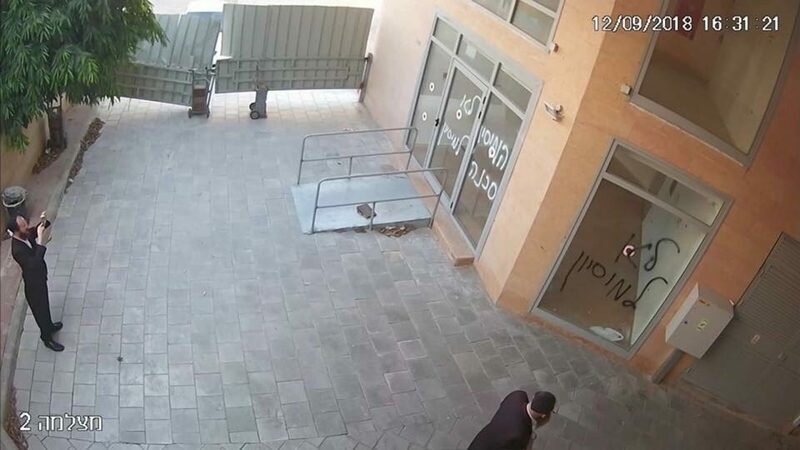 Of course, security cameras outside our building also captured the break-in, and police are now in the process of identifying these individuals who have committed a crime punishable by law. 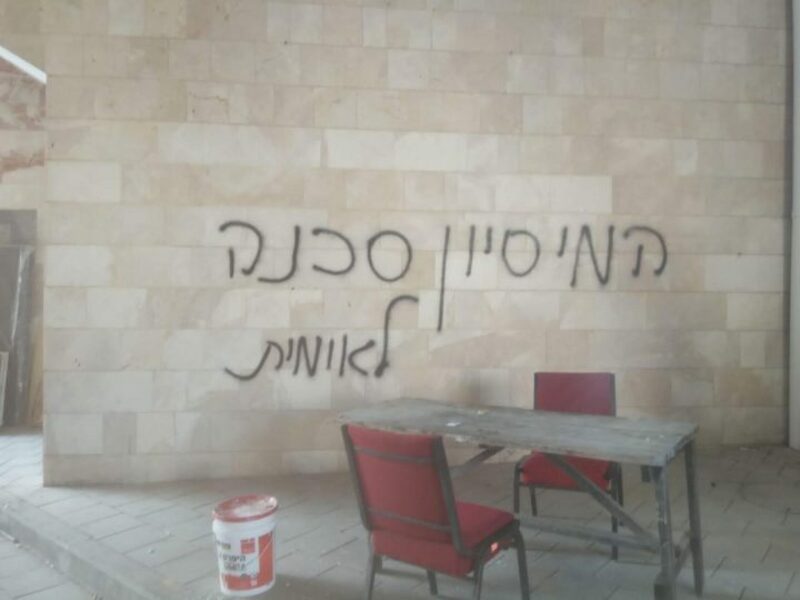 As expected, the police tried to minimize the events as something insignificant, but we insisted that according to the law vandalism and graffiti spraying on private property can be penalized with up to a year in prison. We showed we had evidence of the perpetrators, and the police was basically forced to take out complaint seriously. They will examine the evidence and if they decide it’s sufficient, they will start an investigation. Meantime, we are faced with the financial damage inflicted on us, because as you can imagine graffiti isn’t something that can be washed off with water from steel doors, marble or freshly painted walls. 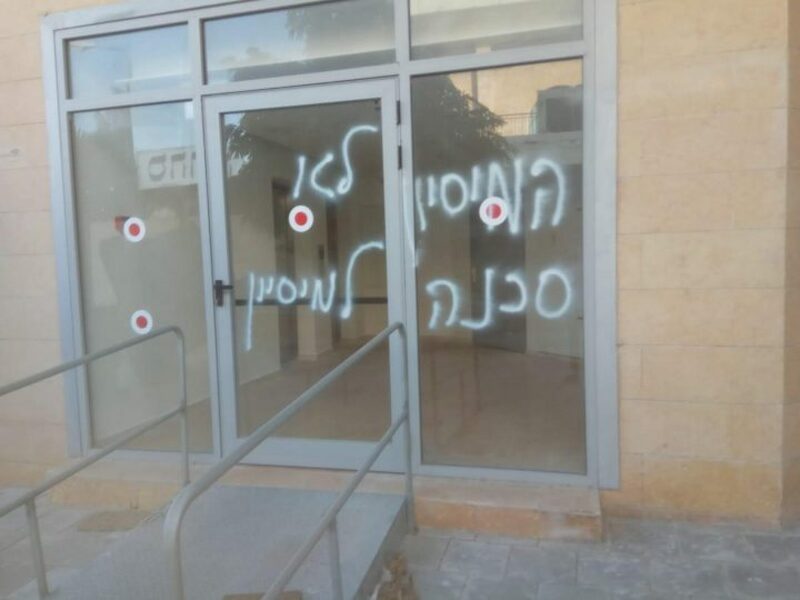 Also, we are fully aware that the religious orthodox community in Ashdod has declared war against us once again, trying to hinder and stop our work in any way possible, even if it means resorting to criminal acts.Despite the upsetting events that again brought us under intense pressure with the rise of the next wave of persecutions, we received some good news from the police station earlier today: They were able to identify the two ultra-orthodox individuals and will hopefully bring them in shortly. Interestingly enough, it is all happening on the eve of Yom Kippur – Day of Atonement, the holiest day in the Jewish calendar. This day speaks of atonement and repentance, about the need in that one perfect sacrifice that will atone the nations sins and wash them clean. Yom Kippur marked the day when the fate of the entire nation of Israel would be sealed.In Old Testament times, the high priest would offer a sacrifice for his own sins, and then he would also offer a blood sacrifice for the nation of Israel, for the atonement of their sins. The High Priest could only enter the Holy of Holies once a year! The New Testament teaches us that we have a greater High Priest in Jesus (Yeshua), who through His own sacrifice and the shedding of His blood reconciled us to God and redeemed us once and for all! We believe that our salvation and redemption has already been won by our High Priest, Yeshua (Jesus), and that our names have been recorded in the Lamb’s book of life! It is God’s deep desire for the nation of Israel to come to know their Messiah, Jesus (Yeshua), and to be saved by receiving his atoning sacrifice for their sins, having their names written in the Lamb’s Book of Life. We encourage you to take this Day of Atonement which starts this Tuesday 18th, Sep. to fast and pray together with us and the whole nation of Israel. There’s immense power in the “prayer of the righteous” (James 5:16), so we will be devoting this Day of Atonement to prayer, and just taking this time to humble ourselves before the Lord, seeking His face and praying for the salvation of Israel and the nations. Please pray for the salvation of the nation of Israel, that they will experience a mighty outpouring of the Holy Spirit, and that Yeshua will be revealed to them as their Messiah who offers them eternal salvation and redemption, and that they’ll see that only through Yeshua can their names truly be inscribed in the Book of Life. Our whole team, including myself, will spend this Yom Kippur in Jerusalem, at the All Nations Convocation, where close to a hundred nations have come together to pray together and praise God in unison. I will be speaking during the meetings as well as leading people from different nations in prayer. It is a powerful time for spiritual breakthrough and we know Yeshua will use this time to do something special in the hearts of men.